As intelligent life forms in many universes join together to mark the 50th anniversary of Dr Who, we thought we'd add our own little anniversary acknowledgement by revisiting the Plus posters' moment of fame! 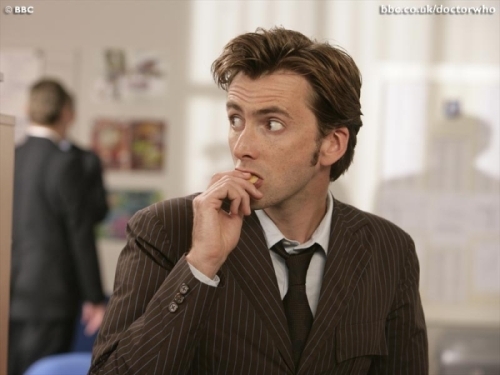 The posters which featured in the episode were launched in 2004, funded by EPSRC, in order to showcase the wide range of careers open to people with a background in maths. 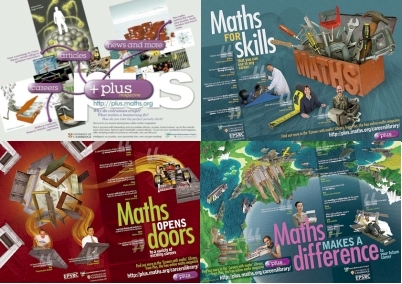 As regular readers of Plus, our free online maths magazine, will know, the huge range of subjects featured in Plus articles is proof of the amazing range of possibilities open to mathematicians - and from avalanche researcher to audio software engineer, almost every field you can think of is represented on the Careers with Maths posters. The posters were intended to spread this message and to be a resource for teachers and career advisors dealing with mathematically-minded students. These and the other Plus poster designs proved enormously popular: at one point Plus was receiving over 1,000 poster requests a day! We are extremely proud of the appearance of the Plus posters on Doctor Who, and very grateful to Charles Trevelyan, Plus's graphic designer. Although the posters are long out of print and no longer being distributed you can still download and print out a copy for yourself from the Plus website.